Sometimes I get the overwhelming urge to just unplug. Turn off the ringing of the cell phone, the bling sound that alerts me to a text, the ding that says I have new email, the FB notifications popping up on my iPhone. I want to just sit and hear the birds, listen to the breeze blow through the branches of the tree. Just sit. Sit and do nothing. Absolutely. Nothing. I’m thinking of starting an hour a day as my “unplug hour.” Anyone care to join me? Jump over to Sharon Gartrell Fort Worth, Texas Photographer to see her Fine Art Photography for this month, then enjoy hopping the circle to see all the challenge photos. Unplugging sounds delightful! I’d love to say I’d join in, but I’m not even sure I could stick to it. How sad is that?! So cool! 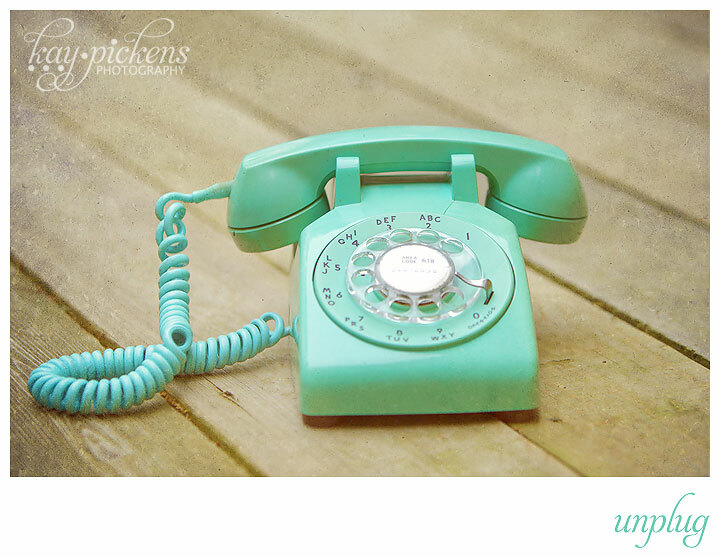 I grew up with phones like that (although not that color, I adore that color!). Unplugging is definitely the way to go! I love this!! I had one in harvest gold. Love the sentiment and the color! So awesome!! Click on the Photo to go to my Artist site where I sell my photogrpahy.